Detectives last night issued a separate warning about a series of armed robberies in the Lakeview area. Another robbery crew, also working the North Side, was profiled in a different police warning last week. • Two people sought help at the fire station outside of Wrigley Field after being robbed around 5:10 a.m. on Sunday, The victims were in the 1200 block of West Waveland when two offenders approached them, displayed a handgun, and demanded valuables. The robbers were last seen running southbound on Racine. 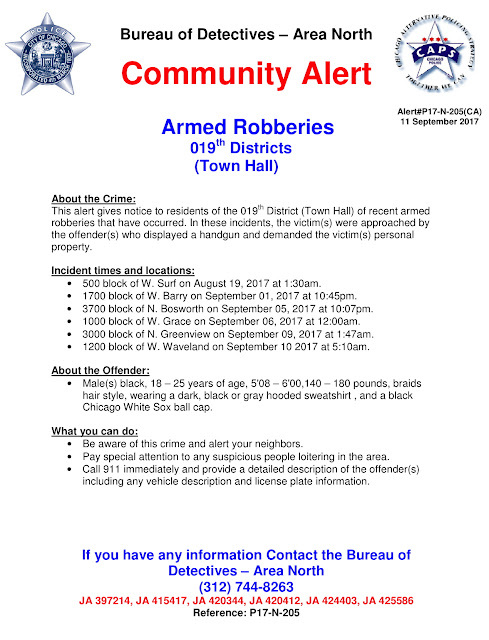 This robbery is included in the police alert. • Not included in the alert is the robbery of a woman in the 600 block of West Belmont around 12:30 a.m. on Monday. The victim was jumped and robbed of her purse by an offender who was last seen jumping a fence near Orchard and Briar. He is described as a black, 5’6” tall, and wearing a red flannel shirt with blue jeans. In the alert released last night, police describe a pattern of robberies in which one or two offenders approach victims on the street and take property at gunpoint. Police said the suspects are black men between 18- and 25-years-old; 5’8” to 6-feet tall; 140-180 pounds with braided hair. One man often wears a black Chicago White Sox hat. • 500 block of W. Surf on August 19, 2017 at 1:30am. • 1700 block of W. Barry on September 01, 2017 at 10:45pm. • 3700 block of N. Bosworth on September 05, 2017 at 10:07pm. • 1000 block of W. Grace on September 06, 2017 at 12:00am. • 3000 block of N. Greenview on September 09, 2017 at 1:47am. Anyone with information about the crimes is asked to call Area North investigators at (312) 744-8263.